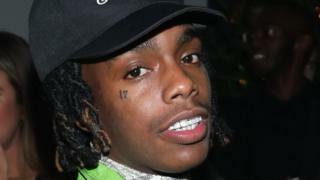 US rapper YNW Melly has been arrested and charged with murdering two other rappers, both said to have been his childhood friends, in Florida. Police say the rapper, real name Jamell Demons, conspired with another man to make the two male victims look like they had died in a drive-by shooting. Before his arrest, he said on social media that "lies" were being told about the shootings. The rapper, 19, has worked with such music artists as Kanye West. Miramar Police Department announced the murder charges against him on social media, saying Mr Demons had been arrested for murder alongside another man named Cortlen Henry - who uses the rap name YNW Bortlen. The victims, Christopher Thomas Jr and Anthony Williams, were both rappers from the same Florida-based crew. Both died of multiple gunshot wounds on 26 October. Police allege Mr Demons shot both men, and conspired alongside Mr Henry to stage a crime to make it appear that they were killed by other people. They say Mr Henry drove both shooting victims to a local hospital at 04:35 local time - where they were declared dead. Police allege Mr Henry's version of events was inconsistent with evidence, including forensics. Both of the victims feature in a documentary about Mr Demons on his YouTube channel, where they are described as his childhood friends. After their October deaths, a representative for the rapper said: "He's sad, he's upset, obviously,"
"Those were his best friends," lawyer Bradford Cohen told the Florida Sun Sentinel newspaper. Before turning himself in on Wednesday, he told his 1m followers on Instagram that a "lot of rumors and lies" were being said about the shootings, and he included the hashtag #freeus. The rapper appeared in court on Thursday, where he was ordered to be held in jail without bail. Mr Henry was reportedly arrested in Texas last month and extradited to Florida this week. The Florida-based rapper has been signed to Young Thug's label, YSL Records, since 2018. He first found popularity after posting his music on hosting website SoundCloud aged 15 - and has since amassed tens of millions of streams and views online. Last year he released a song, Mixed Personalities, alongside Grammy-award winning rapper Kanye West. One of his best-known tracks is a song called Murder on My Mind - which has almost 90m views on YouTube. The lyrics include a graphic narrative detailing an imagined fatal shooting. Mr Demons was arrested several times before - including last month for marijuana possession.